Y-Not Bar & Grill, Meadow Lane, Thurso, Highland is the latest business to join the SSF Affiliated Business Programme. Y-Not is the first food and drink establishment to become part of the programme which aims to give SSF members the best value for their membership possible. 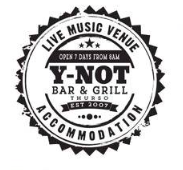 Y-Not is also a live music venue, has accomodation and is a great hangout for visiting surfers and meeting place for local surfers. Y-Not are offering SSF members 10% of all food and drinks purchases. To obtain your discount please log into the SSF member management system SSF.AZOLVE.COM and either print off the page displaying your member number and membership expiry date or save to your phone to present when making purchases along with your I.D. If anyone is having problems logging on to the member management system put your email address as the username and if you can’t remember your password request a password reset. Please click HERE for a full list of SSF affiliated businesses.